My trip to the Vintage Fair! I have had a spell of buying vintage things recently, mainly because of my Birthday, I had some extra cash to splash! I am planning to do a haul blog post in the next week or so, but I wanted to talk about my Sunday afternoon spent at ‘Judy’s Affordable Vintage Fair’ in Ipswich! The fair is the UK’s leading vintage fair and travels around the country to host local vendors and attract the lovers of all types of vintage! I have been before a few years ago and enjoyed it without buying anything, but I was determined to buy something this time – like a hair scarf, or some earrings or something. The dress! Pink with red lace overlay and pearl-like false fastenings on the front and sleeves. Picture also featuring Buddy and Bonnie! but my most exciting buy was a true 1940’s dress! I completely stumbled upon it and it immediately caught my eye. But there was no tag for sizing or price, so decided to look around some more, but planned to check if it was still there before I left. When I returned to the stall it was still there and so planned to try it on. As it turns out it fitted me perfectly! As if ‘made to measure’… I thought it must be fate! Being nearly 80 years old it is fragile and when trying on I found that there were holes in the lace and someone had tried to repair seams and the missing parts of lace with bright red cotton! In my mind it was a risky buy, especially when they told me it was £45! I had bought vintage before but in much better condition and being true 40’s I wasn’t sure if this was a good price or not. 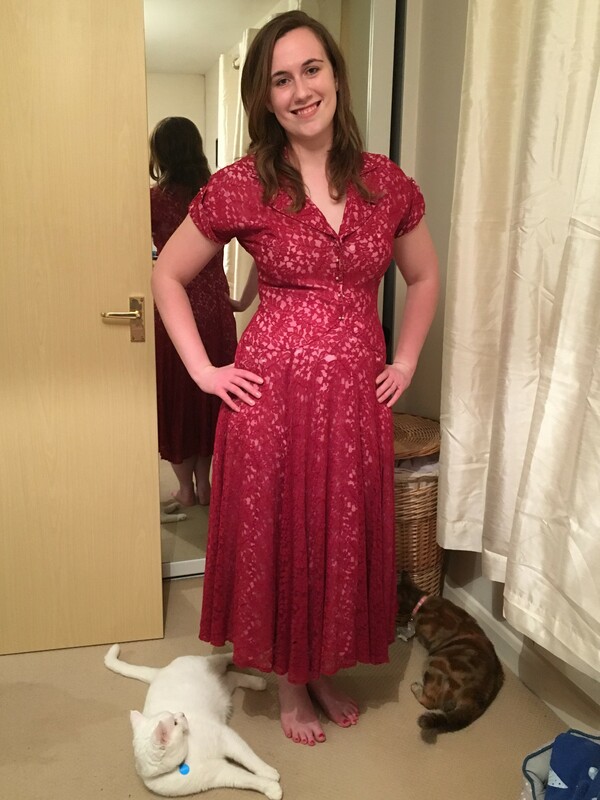 But I was starting to feel sentimental towards this historic dress already as it obviously needed some TLC… so I bought it! If I hadn’t, it would have been the dress that got away… but I wished I had haggled a bit in hindsight! I am no seamstress, and though I know a few dressmakers, I know this dress needs special attention. I have found a ‘vintage specialist’ in London who can do repairs via post and do not appear to cost the earth! I will be contacting them to see what they think first, as I am heading to London next week, perhaps I could drop it off? I hope this dress can be restored to its former glory and I have the perfect idea to style it in my mind! Watch this space for dress updates! Prev My Top Five Essentials! Next My Birthday Retro Haul!